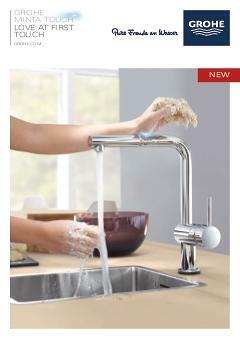 The Minta Touch kitchen tap is a fusion of innovative technology and functional performance! Just a light touch of your wrist or the back of your hand on the spout or tap body is enough to activate the water flow and that means it stays sparkling clean even if your hands are covered in dough or paint. For extra safety – and to protect your children against scalding – only cold water flows when the tap is touched. That means it's wonderfully easy to use and perfectly child friendly, but you can also adjust the temperature as usual using the lever. The Minta Touch has a high swivel spout for filling large pots and a pull-down spray head for extra cleaning power. A quick and easy installation system completes the Grohe Minta concept and its scratch resistant GROHE SuperSteel finish gives it a sophisticated and elegant look. Turning on with a simple touch, the stylish GROHE Minta Touch makes life in the kitchen more convenient than ever before.